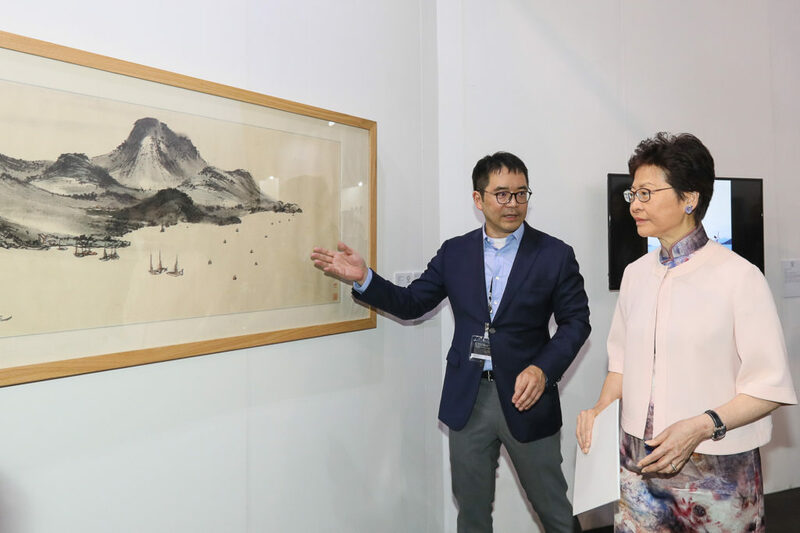 The Honourable Mrs Carrie Lam Cheng Yuet-ngor, GBS, JP, Chief Executive, was Guest of Honour at the Official Opening of Fine Art Asia 2018 and Ink Asia 2018 at the Hong Kong Convention and Exhibition Centre. Boccara Gallery, Paris/Brussels. 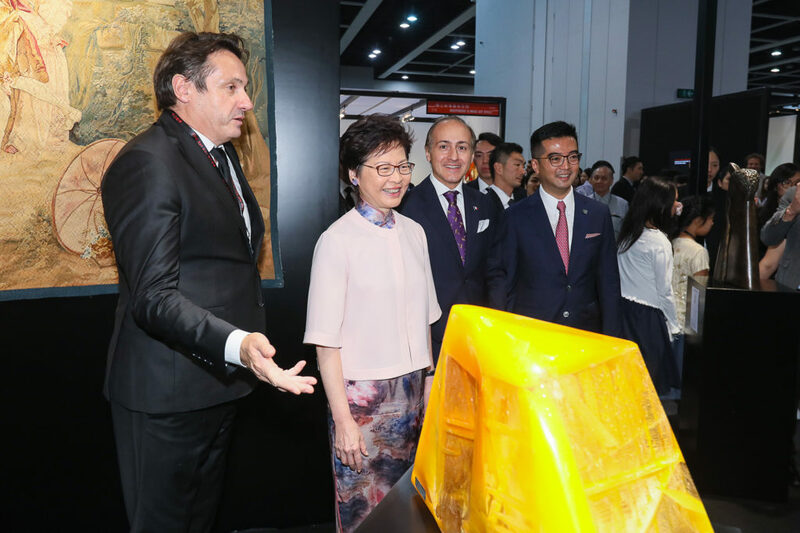 From left: Mr Didier Marien, Director of Boccara Gallery; Mrs Carrie Lam; Mr Alexandre Giorgini, Consul General of France in Hong Kong and Macau; Mr Andy Hei, Director, Fine Art Asia and Ink Asia. with Mr David Pong, Vice Chairman of the Ink Society. 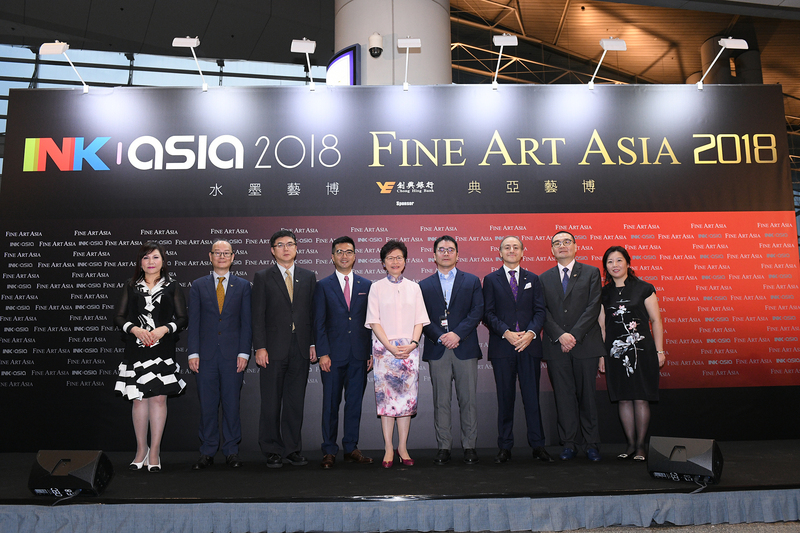 On Friday, 28 September, The Honourable Mrs. Carrie Lam Cheng Yuet-ngor, GBS, JP, Chief Executive, Hong Kong SAR Government, was the Guest of Honour at the Official Opening Ceremony of Fine Art Asia 2018 and Ink Asia 2018. Fine Art Asia 2018 is Asia’s leading international fine art fair, showcasing museum-quality works of art spanning 5,000 years of cultural history, from antiquity to the present day. On display are Asian and Western antiques; jewellery, antique silver and timepieces; Impressionist, modern and contemporary art and design; and photography. Ink Asia 2018 is the world’s first fair dedicated to ink art. The fair features a wide range of media including paintings, calligraphy, prints, sculpture, video and installations, demonstrating that the spirit of ink is by no means limited to traditional paintings on rice paper. This year, both fairs are staged alongside each other for the first time. Mrs Lam visited the booths of leading galleries on a guided tour of the fair. In particular, she admired antique and modern tapestries as well as contemporary art at Boccara Gallery, Paris/Brussels at Fine Art Asia. At Ink Asia, she enjoyed a tour of the Ink Society booth, which features a special exhibition of the works of Lui Shou-kw=n. Mrs Lam has kindly officiated at the opening of Fine Art Asia and Ink Asia for the past 6 years. Fine Art Asia 2018 and Ink Asia 2018 are open to the public from Saturday, 29 September – Tuesday, 2 October, at Hall 3, Hong Kong Convention and Exhibition Centre.